I don’t shoot many landscapes but this has got to be one of my favorite photos that I’ve ever taken, mostly because of the sentimental value. My dear friend Michael Yeh, who was born and raised in Salt Lake, was moving to Houston. We were planning on making the 22+ hour drive together and I had some projects to finish up before the journey. Yeh texted me around 5 asking if I wanted to go hike Ensign Peak and even though I had some work to do, I agreed. 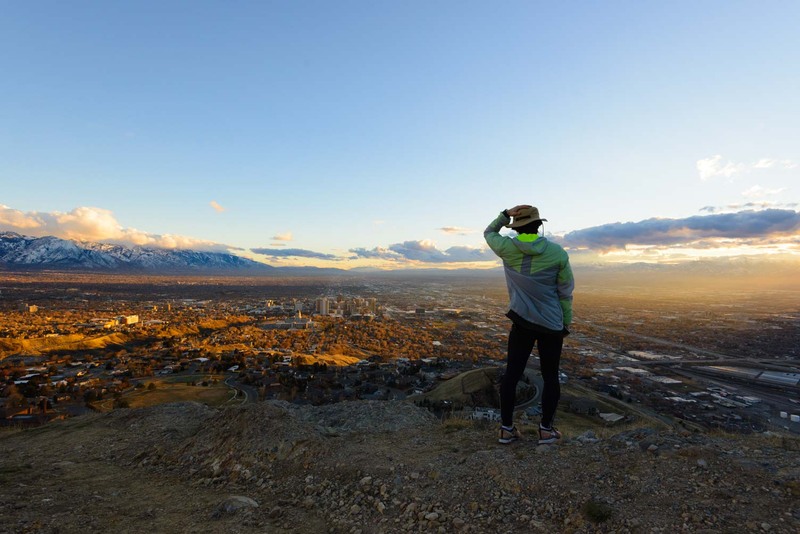 The hike, which features a panoramic view of the Salt Lake Valley from the north end, is a well worn trail especially in the warmer months. Last week, on the clear winter day we went, it was practically deserted. When we got to the top, Yeh made his way to the cliff’s edge to snap a picture with his phone as I readied my tripod. It was pretty blustery and as Yeh reached up to secure his hat, I was able to snap this image handheld. I’d say it’s a pretty perfect keepsake.